Going camping? 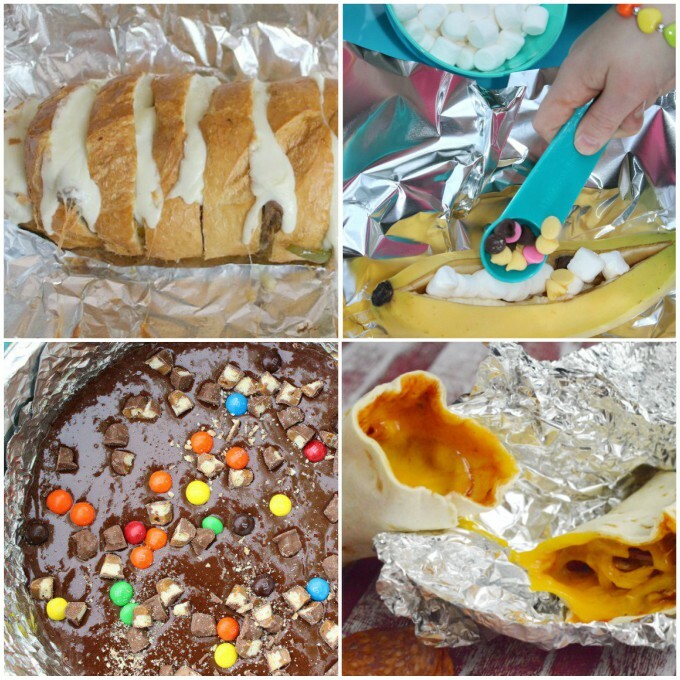 Cooking on the campfire is easy when you make foil packet meals. These pork chop foil packets are delicious and so easy to put together with whatever vegetables you have on hand in your kitchen. We used pork chops, fresh green beans, onions, and mushrooms. It was a great meal for big appetites! My husband recently went camping with his best friend, but he wanted something hearty to take with him since they both have BIG appetites. 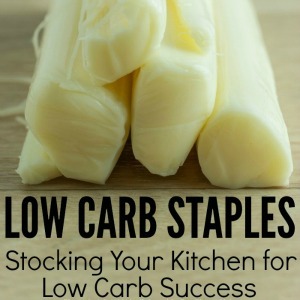 And while normally that would be easy, my husband is also low carbing, so he didn’t want to fill up on carbs and starches, which usually make up a good portion of our camping food. Okay, we’re addicted to hot dogs and burgers and marshmallows when we camp. I’ll admit it. But THIS time, I came up with a meal that’s low in carbs but yummy enough that anyone else who’s with you won’t notice that there are no starchy potatoes or bread to round out the meal. Probably. Step 1 – Tear off a piece of foil big enough for your pork chops and veggies, allowing some room at the top of the “tent” for steam to build. Step 2 – Spray the foil with cooking spray just to make sure nothing sticks. 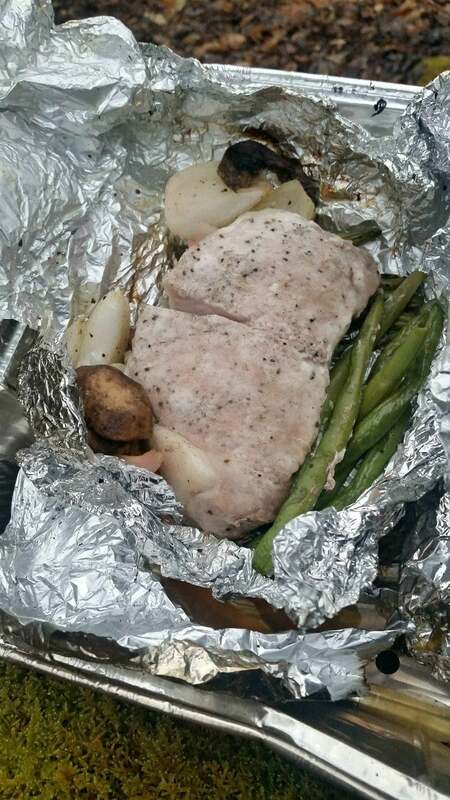 Step 3 – Add your pork chop and veggies to the foil packet. 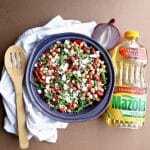 Step 4 – Drizzle oil (olive oil, corn oil, etc.) over the meat and veggies, using about 1 tablespoon of oil. Don’t skimp on the oil… It’s necessary to make sure the food doesn’t stick to the aluminum foil. Step 5 – Add seasonings and herbs. I just added salt and pepper here, but chives, parsley, rosemary, thyme, etc. are all great choices to add more flavor. Step 6 – Bring the sides of the foil up to meet, and fold it down a few times, leaving some room at the top. Make sure the foil packet is sealed on all sides. Step 7 – Pack them away in your cooler (inside baggies just to make sure nothing leaks) until you’re ready to cook your pork chop foil packets. Step 8 – Place your foil packets on a hot bed of coals from the fire. 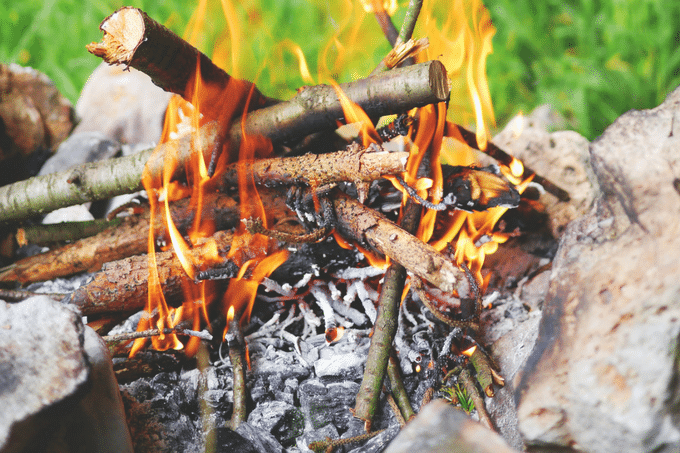 Don’t put the food directly into the fire… put them on the edge, or pull some coals out of the fire to make a smaller area for cooking. Step 9 – Cook the foil packet pork chops for about 40 minutes, or until the meat is cooked through. Step 10 – Be careful when opening the foil packets. Steam may escape and burn the skin, so use tongs. Note: you can put your foil packets in an aluminum pan if you’d like. It’s not necessary, though, as long as you have a good seal on your packets! If you’d like to print and save this recipe, you can use the recipe card below! 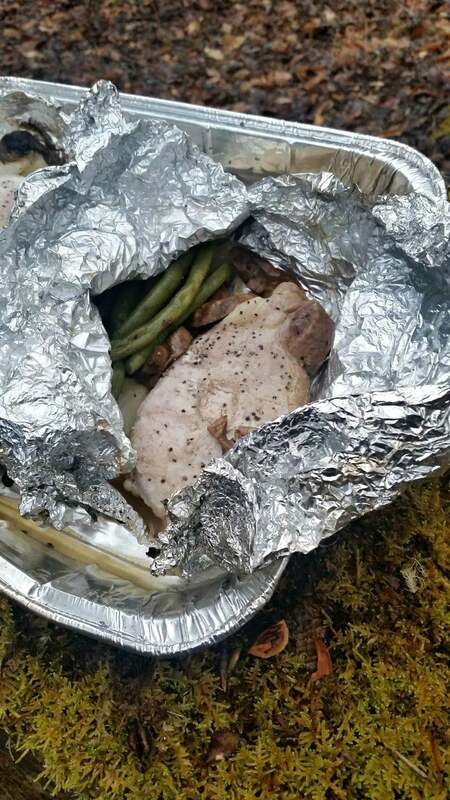 These pork chop foil packets are easy to make on the campfire, and everyone will appreciate having a quality, hearty meal at the end of a long day of camping! Tear off four sheets of aluminum foil large enough to accommodate the pork chops and vegetables. Spray each sheet with PAM. Divide the pork chops and vegetables evenly among the four pieces of aluminum foil. Drizzle the meat and veggies with oil, and season with salt and pepper. Seal the edges of the aluminum foil on all sides, leaving a little room at the top. 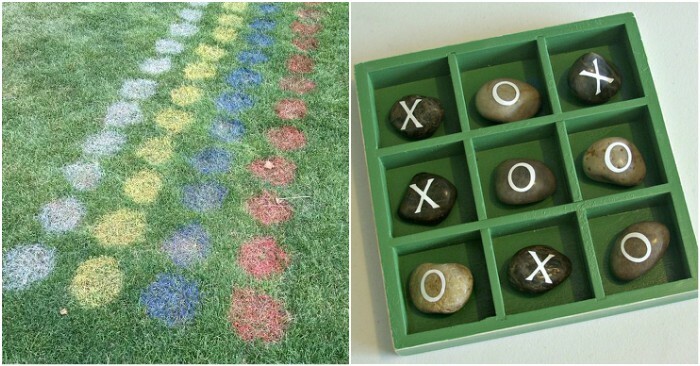 Place the packets on hot coals from the fire (not in the middle of a fire). Let cook for 40 minutes or until meat is cooked through. Open carefully at the top and allow the steam to escape. Let sit for a few minutes. 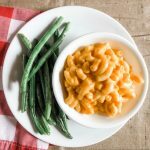 While we only used mushrooms, onions, and green beans, you could easily add quartered potatoes in the packets. 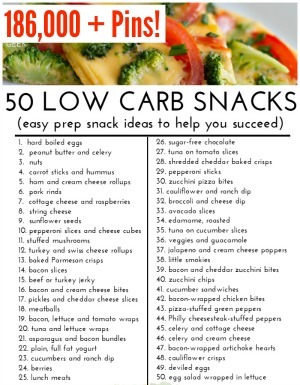 Use your favorite veggies or whatever's in your fridge! 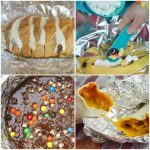 If you liked these foil packet pork chops, you’ll also like this Cheesesteak Sandwich Foil Packet Meal from my friend, Kristi! 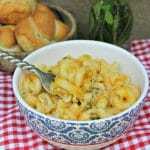 Donella this is a nice recipe for campers and I like your blog as well.